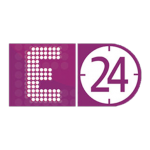 E24 Live is an Indian television channel owned by B.A.G media dedicated to providing nonstop news and other entertainment programs on Bollywood film industry. Since there was no other channel dedicated to provide this sort of programming, the channel instantly grew to be famous soon after its commencement. E24 became the Bollywood No.1 channel providing news in a Modern, Interactive, Informative and passionate way. The channel reports information about Films, Music, Entertainment Reviews, Gossips, Scoops, Scandals etc., in a unique way. Some of the top programs on E24 are Bollywood Reporter, Its Controversial, Filmy Cafe, E Special and one day life. You can watch E24 Live TV on YuppTV from anywhere across the world. E24 live news can be watched on your Smart TV using YuppTV Android App. E24 live streaming is possible on YuppTV website via your Laptop/ PC, Smartphone etc. E24 live channel can also be watched online on any internet enabled device.